I installed a two meter service, one feeds a two pole 40, and the other was an upgrade from 100 to 150. I ran a #4 to the water main and used it for the 150 panel. I reused the #6 for the 40 amp panel. I installed two ground rods, one for each panel, seperate from each other. The boss said I was supposed to bond all the grounds together, by running just the #4 from the 150 to the water main, and bug a #6 from the 40 to it, as well as running both ground rod wires to one ground rod. Is there a code that is specific to this situation. (I live on Long Island, Suffolk County, New York. I don't see anything in LIPA"S redbook. 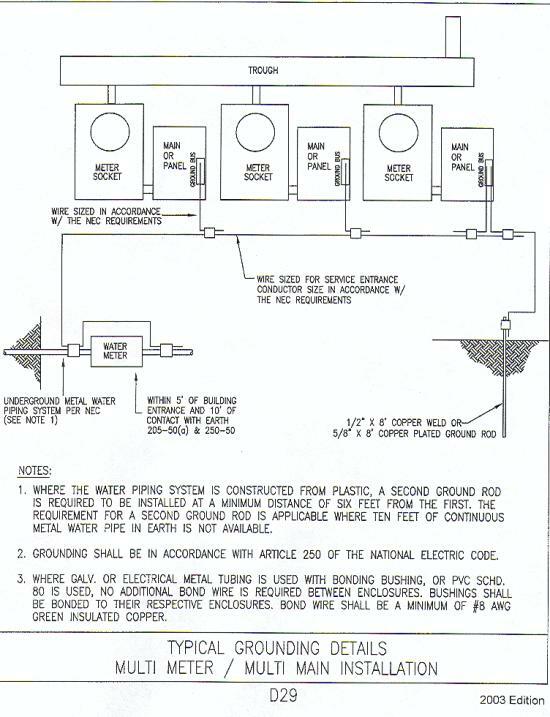 in 250-50, if available on the premises, each item 1-6, shall be bonded together to form the grounding electrode system. I ran #6 from one panel to the other and then out to two ground rods 6 foot apart. One continuous ground going right through one of the neutral bar lug and through both clamps on the groumd rods. Then took a #4 bond wire and bonded the water and gas system out of one of the panels. What size is the service conductors that feed the 2 gang meter (double meter). You base the size of the ground wire back to the water pipe on 250.66. From that, I would bug off to each panel, and not jump from one Bus to the other. I guess I didn't look hard enough in the redbook.